Happy Monday to you! We had a fun working weekend. Between work, the chicken coop, estate sales and spider webs, it went by fast! Good news – we now have nearly all the supplies to finish our chicken coop! 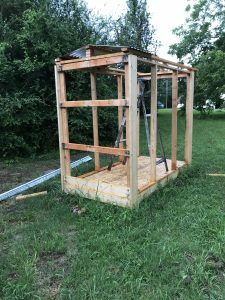 🤗(Still shopping for the perfect door) It’s beginning to look like a steady structure.👍🏻 Aaron spent a few hours in the rain cutting the tin roof. It may seem this is a slow process and it has been. Keep in mind, we’re building this chicken home between our many full time jobs! Saturday was rainy so we didn’t do much “picking”. However, we did hit an estate sale late Saturday morning. This particular estate sale had BEAUTIFUL fine antiques. 😍 (Probably a little to fine for our humble home.) Finally, I made it to the back porch area ANNND I found things I loved!! 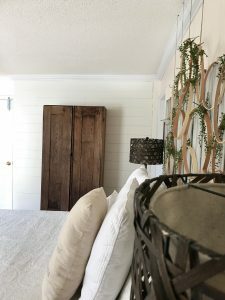 In the the corner of the back porch was the most beautiful old wooden cabinet I’ve ever seen. 😍 It was leaning a little to the right, covered in dust and the inside held an old hornet’s nest. I was suddenly in love but didn’t see a price tag. 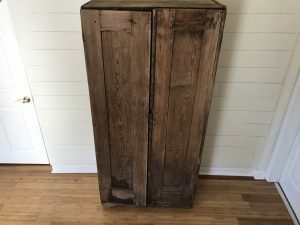 So I inquired about the cabinet and they said it was $100. I knew they would be closing in 20 minutes and Sunday was half price day. 😱 Despite $100 being a good price and the risk of me losing the cabinet, I took my chances and left. We got to the estate sale the next morning and we were the second people in the house. I had a plan..☝🏻Aaron ran to the back porch to guard the cabinet (💪🏼 😏) and I ran to the check out table. He sent me a text saying, “it’s still here” and I handed over $50. It took every ounce of strength within me to help Aaron get that wooden beast inside our house!🏋🏼‍♀️ Once we got it inside I realized it was COVERED in spider webs! 🕷 😷 In fact, I nearly went through an entire bottle of Mrs Meyers Basil Cleaner. As I was cleaning it I began to think of the history this wooden piece had been through. Judging by the nails, it’s well over 100 years old. The more I cleaned it, the more I fell in love. It’s beauty began to show with each fallen spider web.🕷 🕸 This is the first piece I’ve felt would be a lifetime piece for me. Well, that was part of our weekend! It wasn’t glamorous but it was good. We’re building our life/dream one weekend at a time. I love your stories and I am so glad you got the cabinet!! A real beauty!!! Aww, thank you!! Thanks so much for reading my blog! We’re very excited about our chicken coop!! Thanks, Haley!! I was so pumped!! Aww, thanks so much!! Thank you for reading my blog! It’s all gorgeous, and it sounds like a good time was had by all. Congratulations on your lifetime cabinet and your coop!! Absoutely love your blog and your stories on instagram. 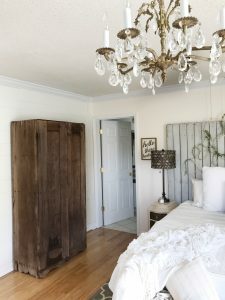 Very fun and entertaining, plus you share beautiful pieces and ideas! I love ❤️ your forever cabinet, it’s amazing! And your 🐥 coop , it’s fun to have weekends like that…. congrats!!!! Aww, thank you!! We’re very excited. Thanks for reading my blog! I love that it still leans a little! And, yes, the back porch, shed, garage, etc are usually the only places at an estate sale that I can afford anything (or am willing to pay!) Love your posts!!! !